First and foremost, many, many thanks to sailing coach, Eduard Rodes, from Barcelona for allowing me to tag along and watch him work. Coincidently, that meant following the Standard Grand Masters (Doug's fleet) around the course. Eduard is Spanish but spoke English with a British accent and also easily switched to Italian and French. He was very knowledgeable and an absolute delight to spend the week with and watch work. He apparently frequently communicates with Julian Bethwaite in exploring new ideas and ways to do things. Small world. 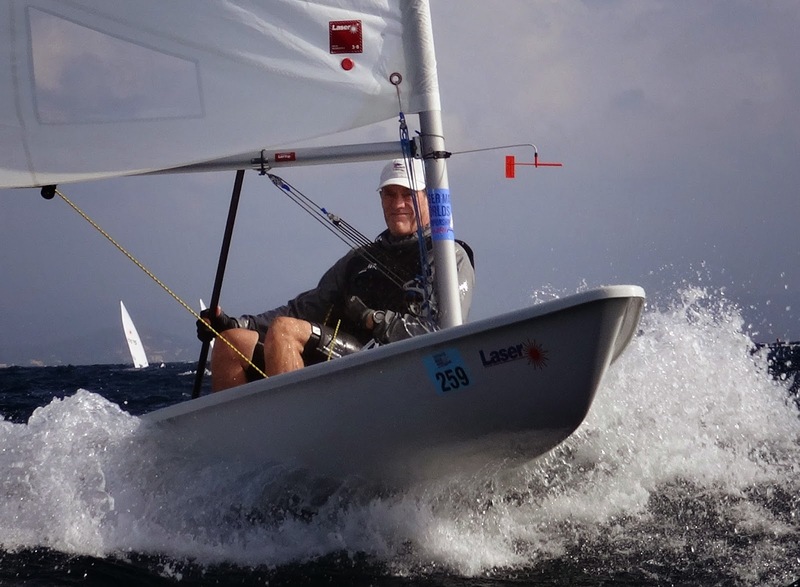 We primarily followed Miguel Noguer, 1980 Olympic gold medalist in the Flying Dutchman class. 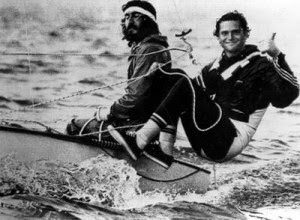 Eduard mentioned that Miguel was an Olympic champion and a dentist but I had no idea that he and Alejandro Abascal earned Spain's first Olympic gold medal in sailing. I would imagine that makes him a bit of national hero in Spain. Leave it to Doug to get lucky and meet just the right people in line for measuring the morning of the practice race and get me such a wonderful front row seat. I spent every day but the last day on the rib with Eduard which allowed us to move among the competitors as though we were one of them. This shot of Tracy Usher between races with my little handheld waterproof camera shows just how close we were allowed to be. Pretty awesome. Getting upwind to the windward mark was a bit of a beating when the wind was up and I noticed the official photographer only made the trip up on the first day when it was relatively calm with flat water. Not even the jury boats ventured up that far. Windward mark roundings were strictly on the honor system. I wish that I could have taken pictures or steady enough video to capture the waves on the windy days. I hung on for dear life on the rib as we climbed up wave after wave and dropped off the other side. There was definitely a pattern of one to two big rolling waves, then a handful of little choppy waves followed by one to two big rollers. I was in awe of the sailors in those conditions because it flat out would have terrified me. There was a capsize witnessed near the rocks that was rumored to have resulted in a death of a competitor which sort of freaked me out. It was just an example of the communication mix ups with various languages being spoken. In reality, one of the volunteers had lost his father recently and scattered his ashes and brought roses for all of the sailor's to drop into the sea on their way to the race course. So far as I know, only two sailors required medical attention. One lost the tip of a finger when it was crushed between two boats and another had a collision between his eye socket and a deck cleat. We were situated close to a French naval base with military aircraft also stationed nearby. On several occasions, we saw fighter jets fly over, fully loaded with bombs. It was a sobering contrast between 499 sailors from all over the world peacefully interacting in a friendly competition versus planes overhead headed to bomb another country. It was impossible not to stop and take notice. There were 499 competitors at this event which is the largest they've ever had. The lady managing the 160 charter boats said there will never be another Laser event this large. They had to buy 160 boats and no one else can afford to do that again. She indicated that the boats were being shipped off to dozens of different dealerships after the regatta. The logistics of distributing and checking in 160 charters, not to mention measuring in 499 boats was quite a feat. Due to language barriers, the instructions on the charters had become confused with half being told they didn't have to keep the numbered trolly with the number assigned to the boat but just needed to have it on a charter trolly and the other half being told that they must turn in the trolly with the same the number as their boat. Sailors coming off the water would stand waste deep in the water alternating between pointing at charter trollies and shouting out for a specific trolly number (in various languages). It was funny and sad all at once. Especially, after one or two charter trollies reportedly sank which turned coming into the harbor into a game of musical chairs with the last person getting tires or bottles to set their boat on. Fortunately, the correct instruction was no matching between trolly and boat number and luckily, Doug, whose fleet was the the last in on the final day, had finished the last race in 2nd place and was able to get a trolly. I have no idea what happened to the last charter guy in. 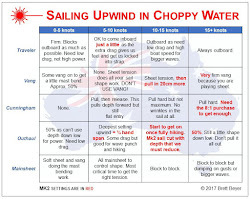 The SIs for the event were made available online only and not printed and handed out at registration but a copy was posted on the notice board for sailors to refer to. The notice board area was fairly large with different panels for SIs, notices, standard and radial fleet scores, and daily fleet assignments for those with split fleets. But the print was small and also posted up high which was the worst combination for Masters over 45 trying to see the information. Everyone was constantly looking for reading glasses or trying to stand back in a crowd to see the board or just asking the person next to them what it said. Doug and I went to read the board one day and he stepped forward and I looked down to find my reading glasses. I then snuggled up behind him, wrapped my arms around his chest and rested my head on his shoulder. Then I had this odd sensation and the guy I was snuggling turned to look at me and I looked left and saw Doug standing next to me. Oops! 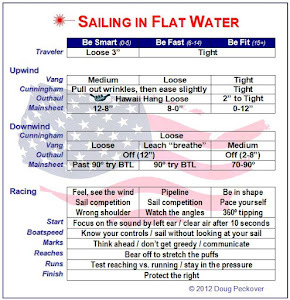 When is someone going to change the rules for Masters regattas to require a minimum 16 point font size for all instructions, notices and scores. Better yet, just project it up onto the side of a building. 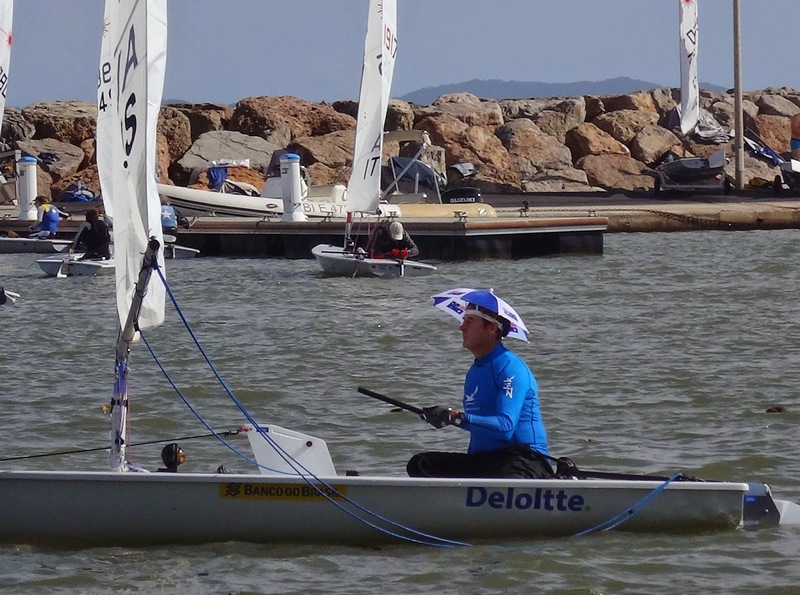 Peter Stephinson, co-inventor of the foiling Laser kit (www.glidefree.com.au), was competing in the Standard Grand Master fleet in Robert Scheidt's old charter boat. He also had 4 Laser foiling kits with him for people to try. The lay day was to have been a chance for demonstrations but the lay day was cancelled which was the biggest disappointment of the trip. 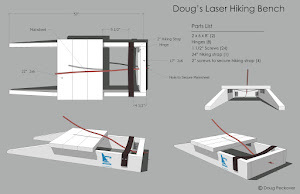 He indicated to Doug that the ideal configuration for Laser foiling was sailing double-handed with a 4.7 rig. Perfect for me and Doug. Apparently, it won't work if you try to sail it like a Moth, instead you just sail normally and up and away you go. He even went out one evening after racing, using a fellow's boat that had pulled the drain plug and it was full of water, but up out of the water it went. I watched him coming into the harbor and land and remove the foils in about knee deep water. It just took a minute. He said they are designed to immediately disengage should you hit something under water and they had in fact hit a stingray once and it disengaged immediately. They plan to test it with a submerged log but haven't found a test pilot yet; however, he's confident it will disengage and not damage the blades. They've had success in the Australian and European markets but haven't yet even attempted to market it in the US. They are looking for a dealer so if you're interested, get in touch with Peter. We offered to bring one back and demo it but apparently we weren't the only ones trying to score a free set for demo purposes ... no shortage of volunteers there. But they are seriously trying to find a US dealer. We asked about the sticking point … the price, and it's not going to be discounted any time soon because they are selling plus they have been named Yachts and Yachting's Dinghy of the Year for 2014. 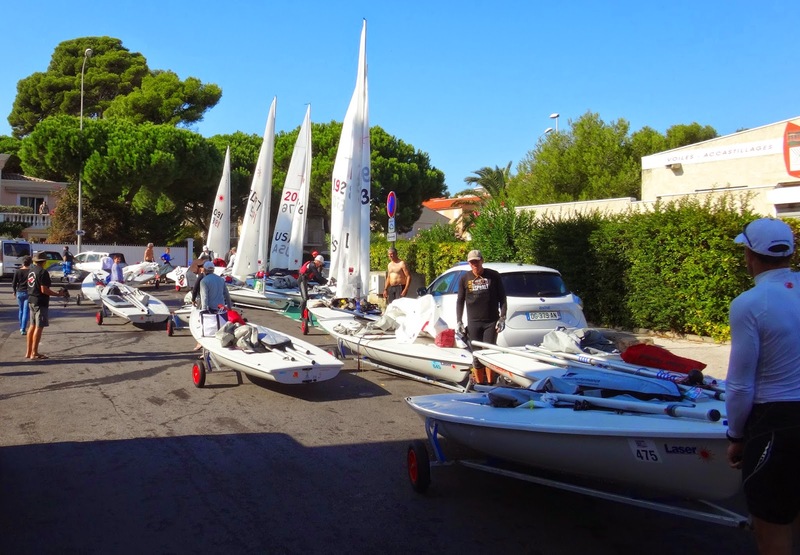 First day of racing was Sunday and it started with a postponement. By the end of the day the notice board announced the cancellation of the lay day on Wednesday. That actually worked out because due to a freak storm in Dallas, it kicked off delays and missed flights that had me traveling for 24 hours and I was really suffering from jet lag. This is how I started the week and exactly how I ended it too.